Quick Update: We Made It, Patrick Believed! + “Off the Grid” until Mar 10. We made it to South Florida! Thank you for praying! We Made It! : We departed Monday, Feb 17 and less than 20 hours later we made the 1100 mile journey from Indianapolis to our new home in South Florida! Thank you to everyone who packed, loaded, babysat, drove, donated and especially PRAYED! Special thank you to Troy’s dad (Steve Cooper) for driving the moving truck with us. We were well received by our Stuart church family (Covenant Fellowship Baptist Church). They had a crew of men awaiting us and our 26′ truck was unloaded in less than 30 minutes. The next night we had a team of students and adult leaders who helped us unpack and put away clothes, dishes, books and clothes. They also dusted the furniture and organized our garage. We are so thankful to the Lord for His provision through this transition. Patrick Believed! : Last Thursday Troy led a prayer walking training with the Martin County Youth Pastor’s Network (previously scheduled in January). It was an encouraging and fruitful time as he, Mayah and Malachi led a brief training and then departed for 45 minutes of prayer through downtown Stuart. Within a few minutes of the walk, Troy encountered a man painting a building outdoors and said “Hello, my name is Troy. We are out praying for the community today and wondered if there was a way we could pray for you”. The man (Patrick M.) was very open to us praying for him and allowed us to share the gospel (Romans 6:23 Bridge) with him. He enthusiastically believed in Jesus (Praise God!!). Troy will begin discipleship lessons with him this week. Pray for Patrick as he grows in his faith and is going to be sharing the gospel with his brother (Robert) this week. We are also very excited that the Lord provided a supporter in Indianapolis who has committed to purchase Patrick a Bible (ESV Study Bible Full-size, TruTone), write him a note of encouragement welcoming him to God’s family and pray for him and his generations of disciples. Praise God! We are so encouraged and excited to have supporters participating in our ministry among 96% unchurched of South Florida in this way. If you are interested in committing to pray and provide for a new disciple in South Florida, please let us know! 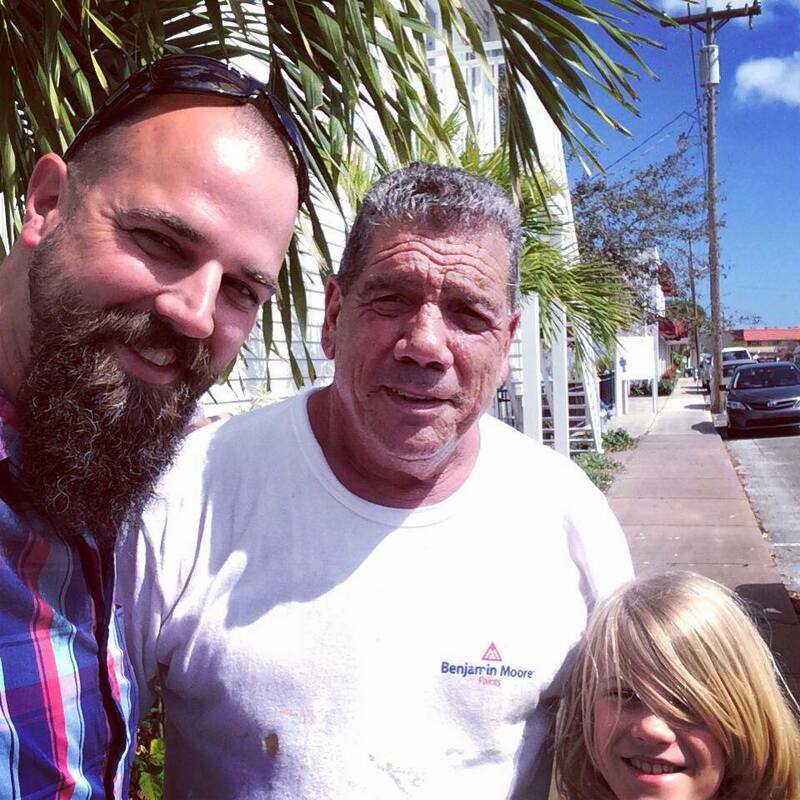 Praise God that Patrick believed during a prayer walking training with youth pastors in downtown Stuart! Pray for him to grow in Christ and reach his community w the gospel! We’ll Be “Off the Grid” until March 10: We are following pastoral counsel to take the next couple of weeks to help transition our family to life and ministry in South Florida. For this reason, we are disengaging from phones, internet and social media to focus on our family. During this time we will get settled, enroll the kids in school, enjoy some adventures together and “learn the ropes” of being Floridians. Your continued prayers for our family are greatly appreciated. We love and appreciate you all and look forward to seeing you in a couple of weeks! For God to continue His mission of making His Name great among the 96% unchurched of South Florida!! That believers in South Florida will actively engage in His mission of making and multiplying healthy disciples and healthy churches. For multiplying evangelism so that every household in Martin County will hear a mouth-to-ear presentation of the gospel. That our home in Indianapolis would sell quickly and that we can find a home to purchase that fits our needs in the area we desire to live. That Rachel can find a good OB/GYN here in Martin County (we miss Pam Templeton). Financial Support: We are still in the process of raising prayer and financial support (currently at 65% monthly need). If you would like to join our ministry support team, please contact us. CLICK HERE for tax-deductible ministry donation instructions. How exciting, Troy, and so confirming that the Lord has you right where He wants you!!! Will be praying for Patrick and for your special ministry in the days ahead too! Love you guys! God Bless your family in Stuart! The updates are so encouraging, please keep them coming!